We’re just a group of moms who have kids with food allergies. Our families lives were transformed by OIT. 78% of us left our local allergist to go and treat with the amazing board-certified allergists on this site. We are REAL moms with REAL kids who had REAL IGE-mediated anaphylactic food allergies. Previous anaphylactic reactions, hospital stays, airborne reactions, multiple food allergies, we’ve been on airplanes with forced landings, ambulance rides…all of it. We lived in fear. OIT was our solution, and it could be the same for your family. We are happy you found the site. Do not rush into treatment. Take your time here: there is a lot to learn, to absorb, and explore. Everyone will think you are “nuts” (pun intended!). Even food allergy support group admins and “leaders” who know nothing about OIT will try and scare you out of it. Virtually all of us now on the other side of fear had the same initial reaction: “What? No way am I am giving my child their allergens!“ So recognize this is a normal feeling and reaction to the idea of intentionally eating allergens. We set this site up because the at-large allergist community has failed us. OIT has been around for YEARS and it is well-known and well-documented it produces desensitization. We are under the care of board-certified allergists who take this responsibility very seriously. Read about them on this site to reassure yourself they are not quacks, or storefront Botox peddlers. What they ARE is amazing human beings and healing physicians. They “doctor.” They use their smarts, brains and scientific training to help children with food allergies live normal, full lives without the crippling fear of accidental food ingestion. We also set up this website because the food allergy organizations like FARE and their parent support groups have failed us. 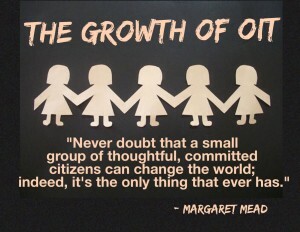 We’ve been “beat up”, yelled at, had our comments deleted and been banned from support groups for talking about OIT and how it has saved our kids. Why be in a food allergy support group if they never tell you how you can get rid of it? That there is HOPE! That thousands of children and adults are safely “getting rid” of their once life-threatening food allergies. Even magazines like Allergic Living which should HELP the community learn, totally refuse to acknowledge that OIT in Private Practice is growing and changing lives every day. Still waiting to read ONE STORY about Private Practice OIT in it. But that’s OK. OUR kids are safe, desensitized, eating their allergens and living NORMAL life. We have no hidden agenda, other than to help guide parents in their knowledge journey and find a board-certified allergist for a consult that could change their family’s life. We don’t get paid by anyone–our reward is thousands of grateful parents and families. Yes, it is that simple. We don’t care if you choose to “DO” OIT or not….only that if you are interested and curious you have the ability to learn about it. OIT is a medical treatment. Therefore there are both benefits and risks. Nothing works for everyone, and OIT does not work for 100% of people. As you will see on many of the allergist sites and in news media stories, in rigid studies OIT is 80-85% effective, and some of our doctors have success rates of 90-95% with “Customized OIT”. They turn away few patients. Yes, absolutely, some do fail treatment. What you do with the oral immunotherapy information is up to YOU. And your doctor. You will be amazed when you encounter an OIT board-certified allergist and get a second opinion. Enjoy your time on the site and hopefully it answers your questions well. We know how you feel and what you want to know because we’ve answered it already hundreds of times. 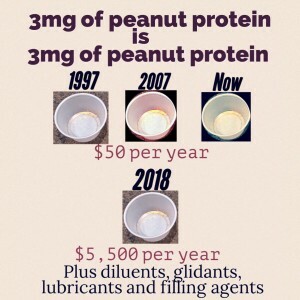 When the Viaskin patch and the FARE/Aimmune “OIT in a kit” peanut flour capsule get FDA approved in 2018 and 2019 everyone will change their tune about OIT, and we will be saying, “Yes, OIT was available in 2009, it’s basically the same thing. 3 mg of peanut protein is 3 mg of peanut protein. Same in 2007 as 2018 . There’s no magic.“ Mother Nature already made a peanut pill: it’s peanuts. And they cost peanuts. A whole generation of kids has had this withheld from them by the OIT researchers. 10 years where millions of kids could have been treated have been lost. For safety’s sake, please never attempt any of this on your own. This website and the Facebook groups don’t offer medical advice: every person who is interested in the treatment must get to a licensed doctor who is a board-certified allergist who can help them manage their unique medical conditions. We’re on Facebook; you can come meet us, ask us questions and become part of our OIT family and community. This OIT101 website was set up as “self-service”: a free static learning center where you can learn about OIT, get the name of the board-certified allergist, and go live your life! Many parents however, have questions, doubts, concerns. 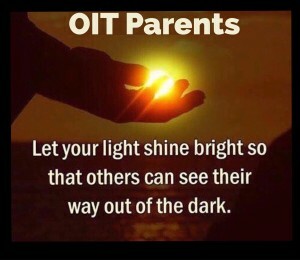 Come talk with thousands of OIT parents (and yes, some adults doing OIT) in our community. 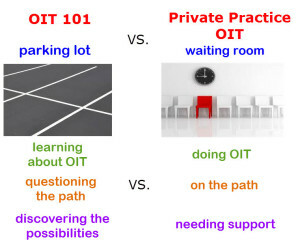 OIT 101″ vs “Private Practice OIT” group? What’s the difference? The support needed during the process of getting information about OIT (OIT 101) is different than the process of actually going through OIT (Private Practice OIT). Some questioning their treatment path (101) versus others trying to understand what is happening day-to-day because they are committed to OIT and are in it (PP OIT). So OIT 101 is about those still discovering the possibilities and existence of OIT and the Private Practice OIT group is for those who are sitting in the office freaking out if they are doing the right thing, having questions, feeling fearful, and needing support. And we are now INTERNATIONAL and continue to grow! 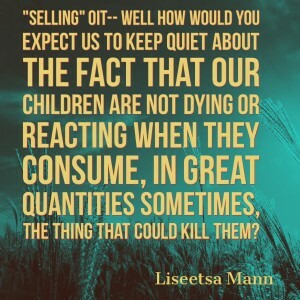 A little history: When Liseetsa Mann started the Peanut Anaphylaxis Cure Facebook group (PAC), she was trying to raise $2 million for Cincinnati Children’s Hospital in 2009 to get OIT / oral immunotherapy treatment for her 5-year-old son who had a peanut allergy. She learned about OIT but could find no one to treat her son. Desperate, she contacted researcher after researcher, begging for help. Everyone told her there was no cure, no treatment. They just needed to practice “strict avoidance” and always carry Epi Pens /epinephrine. Other mothers in online Facebook groups grew tired of her questions and hope, and endless search for OIT. She was banned from many groups. Finally, Dr. Burks, researcher at Duke University, had said he would do an arm of his Duke OIT clinical study at Cincinnati Children’s Hospital if she could raise the money. The hospital ended up backing out, all the money was returned to donors. Liseetsa began to explore moving to Dallas to treat with Dr. Richard Wasserman, a PhD and MD who developed an OIT protocol and was treating patients. Liseetsa’s local allergist called her one day with good news. “I think I found someone who can help you.” Dr. Scott Nash, one of the investigators in Dr. Burks’ clinical trial, was leaving the study to set up a private practice and agreed to do peanut OIT on her son. The family moved to Raleigh for year for her son to do treatment with Dr. Scott Nash. 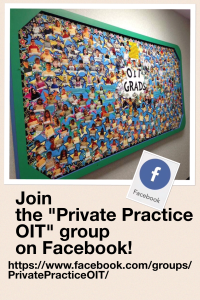 The Facebook PAC group became the blog for their own OIT journey. Over time, word spread and members joined, eager to learn about OIT. Liseetsa shared all her knowledge, happy to have found a “tribe” of like-minded parents: those who wanted a better life for their food-allergic children. She became a “Pied Piper” of sorts, and began seeking and finding new OIT allergists and creating her famous “list.” Only doctors who met the standards set by Dr. Nash were included. Not just great doctors, but great human beings. Friendly office staff. Nowhere she would not take her own children. She coached and cheered and comforted OIT parents on late night calls, advocated and helped with any and all problems. Word spread. In 2013, Liseetsa created the Facebook group “Private Practice OIT ” as a place for families who were doing OIT with board-certified allergists in their own private medical practices. Not studies or academic settings, but a regular doctor. (She created “OIT Trials” for those in trials to get support and talk about their experiences there). Now there are over 5000 members. In the Private Practice Group, discussions are for those in OIT — current and graduated/departed patients and those with appointments to start– it is a WAITING ROOM of sorts. Where we chat and share experiences and ask questions. It’s an unvarnished walk through treatment: with many success stories, and also some failures. And lots of support from a community that “gets it.” There are over 40 individual blogs from families who are going through OIT. 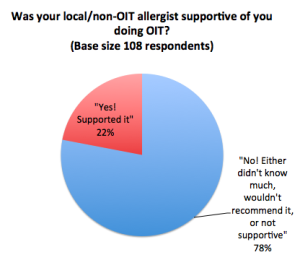 As members shared “OIT Success Stories” in other food allergy support groups, more people joined. Their constant beginner questions were clogging up the feed. People wanting to learn, having fears or questions about OIT and whether it was the right path for them. So in January 2015, Liseetsa created “OIT 101“. The “101” moniker is commonly used for a beginning course–Cooking 101 or Economics 101. So that’s what OIT 101 is: for those who are new, have a lot of questions, aren’t sure about whether OIT is right for them. There are 7,500 members of OIT 101. We ask our “OIT veterans” to join OIT 101 to share experience, hope and stories. For those who are grateful for OIT, there is no better way to “pay it back” by paying it forward and helping other families. As a non-commercial site, we present relevant excerpts of published works in our extensive “Research & Learn” section (over 400 links) with links to the actual work if can find it. This is covered under the “Fair Use” definition: “…fair use of a copyrighted work, including such use by reproduction in copies or phonorecords or by any other means specified by that section, for purposes such as criticism, comment, news reporting, teaching (including multiple copies for classroom use), scholarship, or research, is not an infringement of copyright.” We would hope, in the spirit of transforming children’s and families’ lives that if your content is referenced here, it’s because it has a chance to teach and help others. You will also gain additional traffic from our parents. If you are a board certified allergist interested in joining our OIT Provider List, please complete the Doctor Action form here.